The periodically returning debates and the disappointing bargaining on the financial perspectives for 2007-2013 have led to the proposal of a comprehensive review of the EU budget in 2008/2009. This provides an opportunity for initiating fundamental reforms of the revenue side of the EU budget. One course of reform relies on the principle that the 'own resources' should be collected through the introduction of a European tax. Several options for a European tax were discussed: income taxes, taxes on real economy transactions and finally a tax on financial transactions (tax on stock exchange transactions in shares and bonds, tax on foreign exchange transactions and a tax on 'all' financial transactions), discussed in more detail in the paper. The first proposal, a tax on traditional stock exchange transactions in stocks and bonds, has the disadvantage that the potentially available resources would ensure only a rather small proportion of the revenues of the EU budget. Moreover, the UK and to some extent also Spain would be contributing to the community resources far above the proportionate level reflecting their relative economic strength in the EU. The second proposal, the tax on foreign exchange transactions (the 'Tobin tax'), involves transactions in traditional foreign exchange markets (without financial derivatives). In the absence of experience, predictions about the effect of and revenues from a taxation of foreign exchange transactions are highly arbitrary. Even the most optimistic estimate reckons with revenues covering only about half of those required for financing the EU budget. The criterion of fair contribution across member states is not fulfilled. It turns out that the UK would deliver up to two thirds of the revenues from an EU-wide foreign exchange tax. Other big member states such as Germany, France and Italy would contribute to the common budget with 5%, 6% and less than 2% of the total, respectively. The third version of a financial transactions tax would be a charge on 'all' transactions, i.e. including transactions in financial derivatives. The potential tax base is enormous here by all standards. However, the problem of a fair sharing of burdens across member states would in this case be at least as severe as in the case of the tax on foreign exchange transactions. 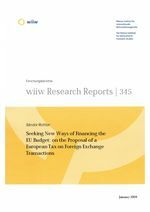 A financial transactions tax, in any of the three versions discussed in the paper, is thought to be introduced in the European Union only and not world-wide. In all cases the problem of relocation (from the EU generally, and from the leading market place, London, in particular) would emerge. The prospect of losing the benefits derived from London as one of the most eminent financial markets in the world would make any British government a strong opponent to an EU-wide financial transactions tax.